Florida tomatoes might be the devil’s fruit. Not only are they flavorless and dosed silly with pesticides and chemical fertilizers, but the Central American migrants who pick them get paid poverty wages — if that. Florida authorities have documented more than 1000 cases of literal enslavement in the tomato fields in the past 15 years. Ferrisburgh resident Barry Estabrook exposes all this and more in Tomatoland: How Modern Industrial Agriculture Destroyed Our Most Alluring Fruit, published this past June to positive reviews. His investigative account deserves placement in the muckraking tradition of Upton Sinclair’s The Jungle, which revealed sickening conditions in Chicago’s meatpacking industry 100 years ago. Like The Jungle and, more recently, Eric Schlosser’s Fast Food Nation, Tomatoland isn’t just a good read — it’s a handbook for activism. Estabrook is spreading awareness of the penny-a-pound campaign for fairer wages for the 30,000 pickers in Immokalee, Fla. Tomatoland persuades its readers to get involved in this effort that has won important initial victories. Seven Days interviewed Estabrook in the kitchen of his elegantly renovated, 230-year-old farmhouse. It sits on 30 acres of field and forest, including a swimming pond brimming with bass. A species of wild tomato grows along the walkway to Estabrook’s door. SEVEN DAYS: How did you come to be in Vermont? BARRY ESTABROOK: I grew up in Ontario, having had the good sense to leave New Jersey when I was a baby. It was actually because my father was working for an aluminum company, and we moved. After graduating from Queens University, I worked for Harrowsmith magazine, which was like Mother Earth News. It was run by James Lawrence, who went on to start EatingWell magazine [in Charlotte] and hired me as the founding editor. I didn’t know much about food at the time, but those who did thought it would be helpful to have someone around to ask stupid questions. That was 1989. After a couple of years, EatingWell started a book-publishing company, Chapters, that I worked for as an editor. It was later sold to Houghton Mifflin Harcourt, so I moved to the Boston area for five years. I met my partner, Rux Martin, at EatingWell. She’s now an executive editor with Houghton Mifflin Harcourt and in charge of a cookbook line. I came back to Vermont in 1997 after Houghton fired me. I got a job writing for Gourmet, which was owned by Condé Nast [a magazine-publishing conglomerate]. Condé Nast let me work from Vermont, flew me down to New York regularly and also had no idea what the rest of the journalism world was earning, so I got a nice chunk of change for some time. Working for Condé Nast, though, was like being a sergeant in Saddam Hussein’s army. They treat you well, but someday, what happened to the guy before you will happen to you, too. Gourmet was shut down in 2009 even though it had close to a million subscribers. SD: That must have been pretty nice, being able to live in Vermont and going to Manhattan every few weeks, where they put you up in a swank hotel. BE: Sure was. The only problem with living in Vermont is a professional one. You can stop learning here because there’s not enough challenge. You need to have young smart-asses around. They’re more tuned in, more flexible, more creative. SD: Tomatoland grew out of an article you wrote for Gourmet. How much of the research for the book came from that reporting? BE: A good piece of it. Tomatoland was meant to be the icing on the cake that I was getting from Condé Nast. I had plenty of time to work on the book. But when Gourmet got dumped, the icing became the cake. SD: What will you do next? Write for magazines? Write another book? BE: You sound like my agent, who’s always asking me the same questions. I will write another book eventually; I’ve got two or three ideas relating to food topics. Right now I have no time, because I’ve been doing nothing but promoting Tomatoland. I’ve made five trips to the West Coast since March. Magazine writing isn’t an option for me. There are very few magazine outlets for the sort of stuff I do. Food mags are all running away from issue-related stories. Food magazines’ big advertisers are food companies, so they’re not going to offend or upset anybody. SD: You’ve been on a long book tour, essentially. Are there still bookstores where you can talk about and sell your book? BE: There’s actually a lot of really cool bookstores in this country. People running a bookstore these days have to be way cool, way smart and way engaged. SD: OK, but I bet a lot of copies of Tomatoland are sold in e-book form. BE: Yeah, more than half. Amazon’s got a special on it for $2.39 until the end of the month. SD: How can you make money when your book is selling for $2.39? BE: It’s not so bad. I get about a third, the publisher gets about a third and Amazon gets a third. SD: What do you think of how big a foodie place Vermont has become? BE: I think it’s absolutely incredible and every year more so. Winter farmers markets, for example, were unheard of a few years ago. Now you’ve got a good one in Burlington. People in Vermont are really fortunate with the access they have to good, fresh food, so there’s no excuse here for eating crap. I met an old-time organic farmer in [California’s] Central Valley — which in itself is rare enough — and he was telling me how lucky I am to be in Vermont. The guy’s got a 12-month growing season, and he’s saying how lucky it is to be getting food from Vermont. SD: Even so, a lot of Vermonters eat crap, same as a lot of Americans do, right? BE: We’re still food illiterate in this country. It’s easy to forget when you live in Vermont or travel in foodie circles, but organics account for about 5 percent of the market in the U.S. It is improving, though. Rux and I were in Shaw’s recently, and we actually counted how many kinds of tomatoes were available. There were 11. People are realizing that they do have alternatives to winter tomatoes from Florida. SD: So you see progress on the issues you wrote about in Tomatoland? BE: It would be a really different book if I wrote it now. The gains made by the Coalition of Immokalee Workers have been major. The campaign to raise tomato pickers’ pay by a penny a pound is making a big difference; it can raise their pay from $50 a day to $80 a day. The workers now also have tents in the field, so they can get out of the sun occasionally. They’re trained in first aid and can recognize pesticide poisoning. They know what to do if somebody gets sprayed. And if somebody says to one of them, “I’m being enslaved,” they previously would have no idea what to do about it. Now they do. There’s also this amazingly revolutionary device that’s been introduced for the pickers: a punch clock. They only have to work a set number of hours now, not as many as the boss tells them to work. SD: So the penny a pound has been widely adopted by food outlets? BE: A lot of restaurant chains and companies like Sodexo have adopted it. But none of the supermarkets have signed on to it, except for Whole Foods. As a result, about half the tomatoes sold in the U.S. aren’t subject to the penny-a-pound standard. SD: You’re speaking at St. Mike’s [on Wednesday, November 2]. What’s your message for students? BE: I tell them that their involvement really matters. The earliest breakthroughs for penny a pound came with more than 300 universities across the country focusing on Taco Bell. When the company wouldn’t agree, students got Taco Bell kicked off about 20 campuses. Then Taco Bell agreed. This group of college students has been called the hedonist generation, but in my experience they’re not that. The other thing I say to them is we all should vote through what we eat. When tomatoes are in season from New Jersey north, by all means, enjoy them. But maybe don’t go eating the tomatoes that come from Florida in February. SD: Do you eat organic? Are you a vegetarian? BE: I try to eat organic. I’m not a vegetarian. We shop at local farmers markets and at the Middlebury [Natural Foods] Co-op. I buy toilet paper at Shaw’s. I don’t have to buy many veggies, though, because of all we grow in our garden. This has been a wet season, so not great for tomatoes, but we typically make a huge pot of sauce and then freeze it in baggies for the rest of the year. We get meat at the Shelburne Supermarket and don’t ever eat feedlot meat. SD: Do you trust the USDA and the FDA to keep the food supply safe? SD: Do you think eating conventional food will shorten a person’s life span? BE: Definitely. Industrial chicken, beef and pork, just for starters, have been pumped with antibiotics all their lives. Hamburger meat you get in supermarkets can come in the same package from cows in Uruguay, Canada and the U.S. Does that make sense? Do you think that’s healthy? 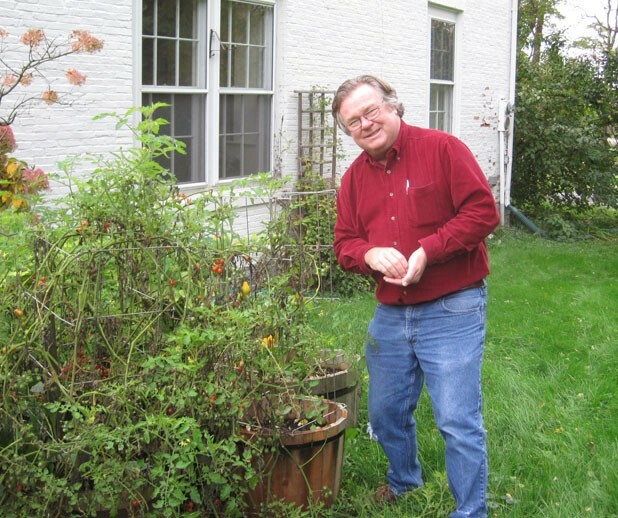 Barry Estabrook speaks on “Slavery, Tomatoes and Social Justice on Your Plate” on Wednesday, November 2, at 7 p.m. at the McCarthy Arts Center at St. Michael’s College in Colchester. Free.